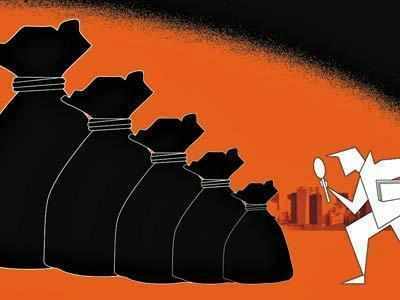 NEW DELHI: Bank of Baroda officials recently stumbled upon illegal transfers of a whopping Rs 6,172 crores in foreign exchange, made to Hong Kong through newly-opened accounts in the bank's Ashok Vihar branch. The Congress revealed details of the case at a press conference on Friday. The bank was alerted to the scam when it found that the forex business of its Ashok Vihar branch shot up to Rs 21,529 crores during 2014-15 - an increase of more than 500 times -- from Rs 45 crores in 2013-14. Between August 1, 2014 and August 12 this year, there were 8,667 forex transactions from the branch, prompting the bank to look into the increase. An internal investigation by the bank revealed that the transactions did not trigger alerts such as the generation of an exceptional transaction report by the branch in North Delhi. The income tax department and other agencies were also oblivious to the transactions despite amounts transferred adding up to several crores a day. TOI tried several times to reach BoB executive director B B Joshi for more details, but he was unavailable. Investigations showed major irregularities, because the forex transactions were done mainly via advance remittances for import, through newly-opened current accounts. Heavy cash transactions -- sometimes four or five times a day -- were also noticed. BoB's internal audit team recently red-flagged the irregularities to the finance ministry. It is not clear yet whether this money belongs to an entity, or a group of people, that wanted its black money sent abroad. Central agencies like the CBI and the ED are likely to soon investigate the matter, said sources. The revelation comes at a time when the Narendra Modi government is trying to ensure that black money does not flow abroad, and instead comes back into the country. The Congress said the irregularity punched holes in Prime Minister Modi's claim that there have been no scams since he assumed office. The Congress alleged that the amount, made up of "black money", was sent out of the country through a series of bank transaction two months after the Modi government took charge at the Centre last year. "Leave alone Vyapam, Lalit Modi or the Chhattisgarh rice scam, I want to tell the PM that this scam is happening in Delhi right under the nose of the Centre," Congress spokesperson R P N Singh said. He added that for the past two days in Bihar, the PM has been saying that there has been no scam since his government took over, and he has repeated the same thing in his speeches abroad. "The bank is in Delhi and the government has all the information about the scam as the audit report was sent to higher authorities. BJP has been talking about scandals. So many scams are coming out, but the PM says that there is not even one allegation against him. We are placing proof of the scam," Mr Singh said, demanding an independent investigation into the transactions. The Congress claimed that the government has been aware of the scam for the past two months, since the time the bank submitted the inquiry report. The Congress spokesperson wondered why no FIR been filed in the case so far. He said such a scam could not have been carried out without the "complicity" of top officials in the banking network and finance ministry. "One is forced to wonder as to how a government bank did not adhere to the very basic due diligence as regards deposits, transfers and withdrawals by any entity," Singh alleged. In its audit report, the entries for remittances -- many of which were done manually -- have allegedly been fudged and many of them have been made by punching the exchange rate as Rs 0.0001 to a dollar when the prevailing exchange rate was Rs 60 to a dollar. While the remittances for exports and imports were normal, suddenly there was a spike of Rs 6172.92 crore transactions in the form of advance remittances for import. "Most of the foreign exchange related transactions were carried out in the newly opened current accounts of some 59 companies," the report reveals. There were heavy cash receipts also in newly opened accounts of some importers. The investigation report accessed by TOI adds that the amount was remitted as advance for imports, and in most of the cases, the beneficiary was the same (such as Victroxx International Ltd, Great Asian Exports, King Winner International Ltd, Star Exim Ltd, I touch Infocomm Ltd, Fortune Trading Pvt Ltd, Jasco Ltd, Mega Forwarders and Traders etc). The amount remitted in all the transactions was less than $100,000. The remittances in all cases were made to Hong Kong, said the report. "It was observed that on many occasions, the party made 4/5 remittances in a single day to the same exporter and the total amount of all the remittances was more than $100,000. 4-5 remittances were probably done to keep the amount of each remittance less than $100,000," adds the report. Explaining the modus operandi , the report states that the branch was in the practice of consolidated reporting of forex transactions against large number of public bills. Docket numbers were not obtained/generated for each remittance and despite heavy advance payments for imports being made to the same suppliers, credit reports of the suppliers were not obtained. And wherever credit reports are available with the branch, the same contained adverse remarks. "The branch has not adhered to due diligence while remitting advance payment for imports," says the report. Subsequently, A-1 form in most of the cases was not signed by the branch head/bank official and in many cases by the customer.